The most iconic goal(s) during a World Cup tournament. By the time this went in the back of the net I hated Maradona with a passion. The goal that had preceded it is almost equally iconic because of the handball. That both happened in the same game, in a match so soon after the Falklands Conflict with Argentina, meant both were destined to become the stuff of legend. Every England fan felt pain with his first, he cheated, end of. But what I remember more than anything (and believe me I've tried to find this) is the commentary from Barry Davis when the second went in. After the ball flies past Shilton he said something along the lines of, 'You have to say that's genius.' It was almost resignation. That Maradona was that far ahead of anyone else on the pitch that we may as well have packed up and gone home there and then. The second goal, so soon after the horrible first, was just that special. The first goal has it's own moniker 'The Hand of God', after Maradona's infamous press conference, but the second doesn't need one, it's simply breathtaking. It's the drag back and turn, inside his own half, as he recieves the ball in order to create space and then the switch of pace that bewitches the England defence. The way he deceives Shilton, bringing him out, then feinting before slotting the ball home. All in the space of nine seconds. It's a goal that as a kid you dream of scoring. It's the type of goal that rarely ever gets scored in a game of that importance. Without the second goal the Hand of God could have just ended up a footnote. Sometimes football is about balance, two bad refereeing decisions that go for each team but this was like one man finding balance, needing to do something extraordinary to prove that he wasn't just about sticking the ball in the net with his hand. He had to score that second goal like that. That Maradona is now effectively looking for redemption again as the coach of Argentina following his drug addled swan song as a player is kind of ironic. He is a man of contradictions but it's not unusual for the very best in the game to struggle to live with their talent. Best and Gascoigne both followed similar self destructive paths, maybe only the truly great can be decent off the pitch and sublime on it. But Maradona was the best player I've ever seen live (well on my telly box). He produced at every level of the game, something that I truly hope Messi gets to do over the next month or so. And yet of course I hate him. That England fought back and got so very close to equalising makes the first goal galling, I vaguely remember that bookies in England paid out for a 1-1 draw despite England's defeat. I love stuff like that but when Maradona scored that second goal I think we and the rest of the world, knew the game was up. He netted another two in the semi against Belgium, before playing more of a fulcrum role in that classic final against the Germans that followed. 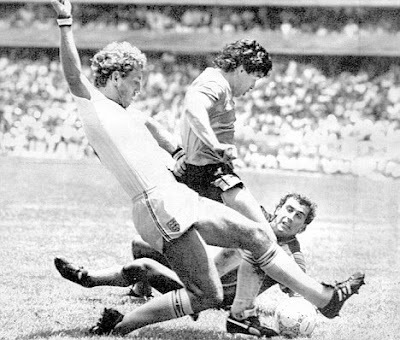 Linekar went home with the Golden Boot that year with 6 goals but it was Maradona's tournament. I wonder though if he ever looks back at the first goal against England and regrets it, because there's no doubt it soured the tournament for many and spoilt the way they he was perceived the world over. Looking back now the defeat still hurts and the manner of it still leads many of us to believe that England could have gone on to win the trophy. But for 4 minutes Maradona changed the way I saw football. It was a defining snap shot for me as a young fan of how ugly and beautiful the game can be. But for the 9 seconds that Maradona held the ball and ran at England he mesmerised me. The dribble nicks it as the most iconic because it's 'pure' but if you suggested the 'Hand of God' you get mentioned because you were only four minutes out and lets face it I'll never get to say that in an icon post again. So the second goal gets the picture and the first gets the quote and you get both goals in this video. They are two different goals but you can't have one without the other. "I was waiting for my team mates to embrace me and no one came,... I told them, 'Come hug me or the referee isn't going to allow it." Ok.... so that sorts out who wins and you'll get your dedications at the end. But but but... so many goals suggested today. And a few are worth a mention because one got me off my seat and some are just remembered for being awesome. Tonight's post is dedicated to (from twitter) for 'The Hand of God' @comedyfish, @AverageUsername, @Jackster, @fionaflaherty, @OneInchMan, @twosoups and @jackfaulkner (and from facebook) Toby. And for the second goal (from twitter) @ iamhewhoisiam, @Girl_In_A_Box, @jezzalc, @jaxsensei, @lmlc and @fatmanslimming and @fionakyle (via facebook). do you think that counts??!! !haha.